It's hard to believe the blue of Peyto Lake. In pictures, the color of this radiant body of water looks enhanced or altered in some way, but when you see it first hand, you realize it's resplendently real. 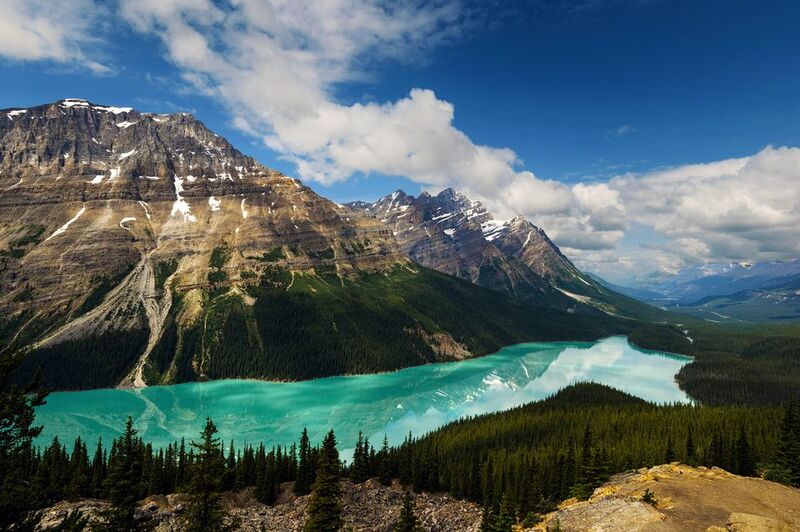 One of Banff National Park's most beloved attractions, Peyto Lake (pronounced pea - toe) gets its famous turquoise hue from ancient glaciers that melt "glacial dust" into it each summer. When the sun hits the lake, the blue rock powder radiates a crystal blue. Though Peyto Lake is too cold for swimming, crowds still flock year round to behold its clear cobalt waters, framed by the forested shores and the snow-capped Rocky Mountains. Peyto Lake is named for Bill Peyto, an immigrant from near Banff, Scotland (where Banff, Canada gets its name) who worked the railroad, fought in WWI and was one of Banff National Park's earliest wardens. A large photo of Peyto figures prominently at the entrance of the park. The lake's elevation is 1,880 m, its length is 2.8 km, and its area is 5.3 square km. Visiting Peyto Lake requires getting a Banff National Park pass. Peyto Lake Lookout: Peyto Lake is in Waputik Valley at the north end of Banff National Park, close to the British Columbia/Alberta Border. The lake's lookout point is easily accessible off of the Icefields Parkway (Hwy 93), about a 30-minute drive north of Lake Louise, an hour from Banff and two and a half hours from Calgary or an hour south of the Jasper National Park border. Peyto Lake is most popular purely as eye candy from a lookout point a few minutes off the highway. Signage is not the best so keep your eyes peeled. Heading north from Banff or Calgary, it will be on your left-hand side. Free parking is available and then a fairly steep 15-minute walk on an asphalt path takes you to a platform viewpoint. This path is tree lined, and when it opens up onto the vista of mountains and Peyto Lake, the effect is stunning. The path surface is flat, so technically accessible, but keep in mind it is quite steep. Bow Valley Summit: Most tourists end their visit at the Peyto Lake Lookout after they've gotten their photos, so if you want a more elevated, quieter, and less crowded view, continue on to the Bow Valley Summit. From the platform, turn left and follow a paved trail uphill to a three-way split, where you'll take the middle path, which switchbacks up the mountain, through an alpine meadow, to the Bow Valley Summit that gives among the highest panoramic views of the Rockies and glacial lakes. Getting to the Bow Valley Summit requires a couple of hours and proper footwear. Expect to hike some rocky terrain. Peyto Lake Shoreline: Peyto Lake itself is fairly inaccessible, and because there is limited recreational activity, most people are content to simply survey it from above; but, if you have the determination to dip your toe in its icy waters, head down the path from the Peyto Lake Lookout. Be advised the journey a is steep one with no switchbacks. Getting down and back should take about an hour. Consider turning the driving over to professionals. Sundog Tours is a reputable, longstanding local tour operator. The guides are vested in the health and welfare of this region and their knowledge is expansive. Peyto Lake Lookout is open year-round but is most popular by far during the summer months. Spring is beautiful because the lake has melted and flowers are out. Fall offers a different, crisp take on the lake, but the surrounding forest is largely coniferous, so there is no fall foliage color to speak of. Winter has its own benefits if you're a hardy, more adventurous traveler, but you do not get to see the color of the lake because it is frozen and likely snow-covered. The Peyto Lake Lookout gets very busy with selfie stick-wielding crowds, which can dampen the overall effect of this natural wonder. Head there in the early morning (before 9 or 10 am) or later afternoon to avoid this commotion. Looking at Peyto Lake, taking a photo and getting back into the car, is really what most people do here, but hiking up to the Bow Valley Summit is second. Fishing Peyto Lake is allowed in summer months but requires a license. Though there is no camping on Peyto Lake, several campsites are nearby and Banff National Park, in general, has many campgrounds. Some are by reservation; some first-come, first-serve. Most cost about 20 or 30 Canadian dollars for a night. Waterfowl Lakes Campground is a 13-minute drive away. It has 116 campsites available on a first-come, first-serve basis; toilet facilities and food locker storage. Mosquito Creek Campground, despite the forbidding name (actually, mosquitos are no worse here than anywhere else in the park), this campground is an excellent spot to pitch a tent. Though rustic (no flush toilet or shower facilities), there are excellent Bow River views. Thirty-two campsites are available on a first-come, first-serve basis. There is a communal eating hall, food lockers for walk-in campers, and solar treated potable water. Not much. There is a dry toilet in the parking lot area. No trinket shops or places to buy snacks. The nearest place to stop for food and drink is the Num-Ti-Jah Lodge, built in the early part of the 20th century, and open throughout the year, though closed for a short time between winter and summer season. To keep Banff National Park as authentic as possible, stores and restaurants are few and far between. Pack water, tissue, snacks, bug spray, and any other necessities before you head out. Six minutes away, Num-Ti-Jah Lodge has more than a dozen guest rooms with exquisite mountain or lake views. The lodge was the vision of young Jimmy Simpson who journeyed from England in the late 1800s to live the life of a mountaineer in Canada. Several other lodges are within 30 to 40 kilometers of Peyto Lake, but most of the available accommodation will be in Lake Louise or the town of Banff. Be sure to book early if you are traveling in summer as everything fills up. Two of the most popular hotels in the park, though also two of the more expensive ones, are the Chateau Lake Louise and the Banff Springs Hotel. Both are former Canadian Railway hotels now owned by Fairmont. Get there early to avoid crowds (plus early morning sun is better for photos). Weather conditions can change quickly in the park and it is often cooler than you may have imagined, especially in summer. Dress in layers. Bring some bug repellant. Mosquitoes are plentiful. Perhaps wear a light long-sleeve shirt. Continue past the first parking to the "bus parking," which also has room for cars and is closer to the hiking trail. Especially if you have some less able people with you, drop them close to the trail because the hike from the lower parking lot can be challenging. Bring water, especially if you plan to hike. Even if you don't do the hike up to Bow Valley Summit, try to escape the crowds for a moment and head off the platform to the left, go back on the paved trail and you'll soon see a dirt trail going down towards the lake to the right. Take it for a couple hundred feet to a clearing where you have an unobstructed view and likely some peace and quiet. If you are planning to hike the area, have your directions on hand because signage is not that great.